In part one of our MixMaster series leading up to the World of Concrete, we highlighted the fact that contractors don’t have to worry about tripping over pre-positioned injection ports when using this gun. With the MixMaster Pro system, the port travels with the gun and isn’t left in the hole. So there's less to trip over or have your hoses and cords get caught on. If you have a system where you are clamping the gun to the port, then frankly, I am sorry for you. I have seen first-hand how tedious it is to keep that connection clean and how much fun it is (NOT) to scrape cured foam off the vise grips and mixing module face of the gun. This is a time waster for sure. With the MixMaster Pro, you are able to move quickly from point to point, which saves time and money. When I train installers in the field and we switch them from their spray foam style guns to a gun designed just for slab lifting, you can see their eyes light up once they realize how much easier it’s going to be. The elimination of a port required for every hole not only eliminates a tripping hazard, but also maximizes production and reduces the cost of consumables. On a typical job with traditional impingement guns, you have to place an injection port in every hole. It’s a 5/8” hole to start with as opposed to a 3/8” hole with the MixMaster gun system. 3/8” holes take less time to drill, include less expensive drill bits, and reduce the percentages of hitting rebar or wire when drilling through a slab because of the drill bits having a smaller diameter. Once our 3/8” holes are drilled it’s as simple as inject, monitor, and move to the next point when it’s time. The other systems require: drilling 5/8” holes, hammering in the port and tightening with a wrench to anchor it into the slab, connecting the gun to the port with an overpriced, modified vise grip, then injecting until it’s time to move. I have been on many jobs where this system is implemented and it is a LOT slower. Increasing production is a way for you to realize the most savings, but you also can’t discount the savings on the consumables like the ports themselves. MixMaster ports are 3/8” diameter and they cost less than larger 5/8” diameter sleeved ports. So even if you used the same number of ports, the MixMaster system would be more cost effective. Now factor in that you can do a typical residential job with one or two ports compared to 10-20 for the other guys, and those numbers will add up over time. I consulted with one of our customers on a residential stabilization job a few weeks ago and the guys drilled a grid pattern with at least 50 holes. They used two ports with our MixMaster Pro system. A week earlier they would have used 50 ports. That saved them over $50 on materials for that job; not a huge number but it adds up over a week, or a year. That’s the cherry on top of all the money you can save on labor with our system. 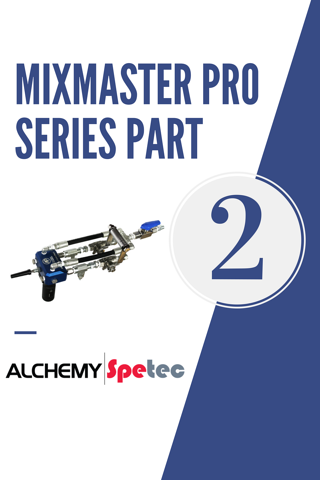 Stay tuned for part 3 of 4 coming in a few days, in which I will continue to illustrate the low operating cost of the MixMaster Pro slab lifting system. If you are currently struggling with the cost of cleaning, maintaining, and buying parts for your impingement guns, you will want to read this next one. I look forward to seeing you all at the World of Concrete, booth O40551. Click here for an automatic discount on World of Concrete registration!